Email Extractor,Email Leads Extractor,Extract email addresses from any text with this free online service. Simply copy, paste and start extracting. Text-Filter.com will remove any ads that are reported to us as being scams. If one of the advertisements on our site is not providing what they are advertising to do so, please email us the details and we will remove the ad. Flip Text - Online Tool. Rotate letters 180 degrees with Unicode. Flip Text » Write Upside Down Text & Backwards Effect. 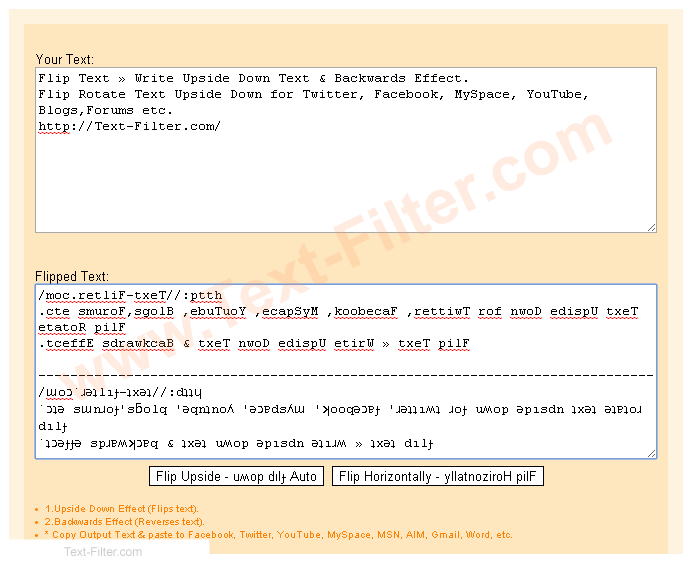 Flip Rotate Text Upside Down for Twitter, Facebook, MySpace, YouTube, Blogs,Forums etc. Flip Rotate Text Horizontally for Twitter, Facebook, MySpace, YouTube, Blogs,Forums etc. Simply PASTE the plain text below. Screen Shot Help " How to use "